No Business Mountain is located in central Idaho’s West Mountains, just west of the town of Donnelly. There is a fire lookout tower on the summit, with great view’s in all directions. The lookout was originally built in the 1930's by the Civilian Conservation Corps, and then rebuilt in the 1960's. It is possible to drive to the summit via a jeep road from the north, but a better option for hiking is to wander up the south ridge of the mountain, starting from where the road crosses No Business Saddle. Round trip is only about three or four miles round trip, so it’s not a bad option if you have a little time to fill. Just be prepared for cross-country travel. I’d been meaning to check out this peak for a while now, partially for the views and partially because of the unique name. A group of buddies from high school were hanging out at a friend’s cabin nearby, and three of them were up for some hiking, so off we went. No Business Saddle is easy to locate and well-marked. We parked there, and then started wandering through the brush to the northwest. It wasn’t long before we came across an old logging skid trail that we followed up the slopes. After a while, the skid trail ended, but game trails continued through the forest making for mostly easy travel. The forested section didn’t last long though, and we started getting some good views higher up. Council Mountain dominated the views to the west, with the expansive Long Valley stretched out before us to the east. The weather was clear and sunny, and we enjoyed a leisurely pace up the gentle ridge. It took us an hour and a half to reach the lookout building, where we gawked at the views for a while, then wandered over to the true highpoint just a quarter mile to the west. (Not sure if it was actually any higher.) Next we hiked further west to check out the funky looking FAA radar gear. From there we had good views of both the Wallowas and Seven Devils. Very cool. We pretty much retraced our steps on the way back down, and arrived back at the trailhead where we were joined by about 25 folks on ATV’s taking a lunch break. It had taken us a leisurely three hours to make the hike, which was just under four miles and 1700’ elevation gain round trip. 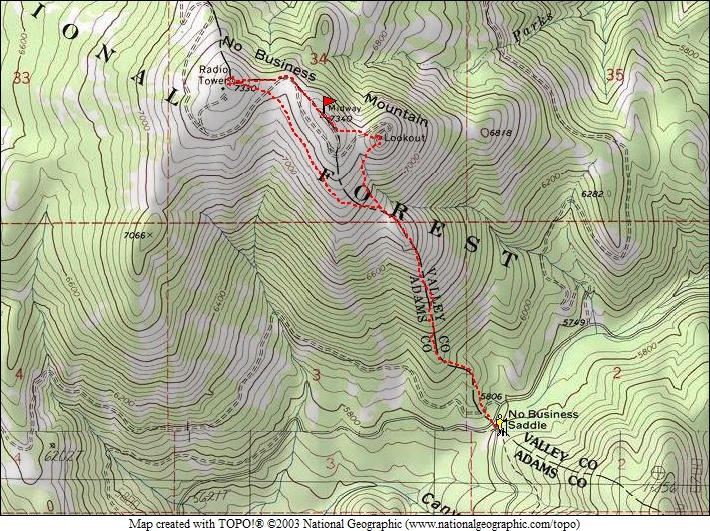 Map of our route, just under 4 miles and 1700' elevation gain round trip. Some light bushwhacking on our way up. Views getting better as we get higher. Rocky section on the ridge. Zoom in view of the lookout building. Checking out the views of Council Mountain. Cascade Lake in the distance. Group shot at the lookout. Good view of the Seven Devils in the distance. Another look at the lookout. Looking back at the lookout on No Business Mountain. Benchmark on the highpoint of No Business Mountain. We decided to go check out the other side of the mountain. Some sort of FAA radar equipment.